David Deamer began studying the origin of life in the early 1980s, and his research over the past 30 years has had a major influence on scientific understanding of how life on Earth got started. 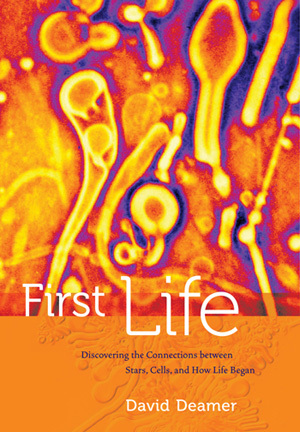 In his new book, First Life (UC Press, June 2011), Deamer presents a personal history of his work in this field, while also providing an engaging and accessible overview of research into life's beginnings. The book describes this research within the framework of a new scientific discipline called astrobiology, which studies the origin and evolution of life on Earth in a broader cosmic context. "Astrobiology is a narrative that encompasses our understanding of star formation, the formation of our solar system, the early Earth environment, and how chemical compounds behave in such a way that they are driven toward increasing complexity of structures and interactions," said Deamer, a research professor of biomolecular engineering in the Baskin School of Engineering at UC Santa Cruz. The main focus of his research has been the role of membranes in the origins of life. He began his career studying the biophysics of cell membranes, which are made of molecules called lipids. In the 1980s, he demonstrated that meteorites contain lipid-like molecules capable of forming stable membranes. More recently, research in Deamer's lab has shown that lipid membranes have an organizing effect on other molecules that helps small molecules join together to form longer polymers similar to the nucleic acids RNA and DNA, which are essential to all known forms of life. This organizing effect of membranes is seen when chemical mixtures go through cycles of wetting and drying, as would occur along the margins of pools of hot water on volcanic sites. Such sites would have been a common environment on the early Earth. Wetting and drying promotes chemical reactions and also causes lipid membranes to form compartments that encapsulate different mixtures of compounds. According to Deamer, the first life emerged from the natural production of vast numbers of these membrane-bound "protocells." "The first life was not just replicating molecules, it was an encapsulated system of molecules--a cell," he said. The most recent findings from Deamer's lab, published in the January issue of the journal Biochimie, showed that wet-dry cycles in a system including membrane-forming lipids can drive the replication of a DNA molecule without any need for the polymerase enzyme that performs this function in living cells today. "Some people are still skeptical--I think the new results have to soak in for awhile, and the experiment needs to be repeated by others. I've had this idea for the past 20 years that lipids could have an organizing effect that helps polymerization occur and then encapsulate the resulting polymers to produce simple cellular structures," Deamer said. In addition to laboratory experiments, Deamer has conducted field experiments at volcanic sites in Russia, Hawaii, and California. "I think we need to be bolder in testing our ideas," he said. "There has to be sufficient complexity in our experiments to match the complex conditions of the origin of life. That's one reason I started doing experiments in real-world environments." Deamer's long involvement in research on life's origins and his personal relationships with other leading scientists in the field has enabled him to give readers of the new book a "behind-the-scenes" look at this exciting scientific quest. "In First Life, Deamer offers a delightful synthesis of research into life's dawn with his own vision for how it came to be," wrote science writer Carl Zimmer.